My preschool daughter likes to hear stories from the Bible. She started Sunday School last year, and they've been discussing parts of Old Testament and New Testament. This last Sunday she learned of Lydia, a woman who sold purple cloth. Sunday School ends in a few weeks for the summer break. Our home studies will continue, however. 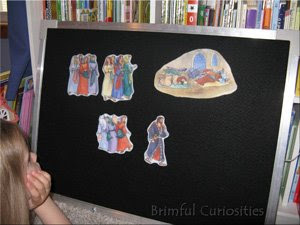 Sunday School teachers often use felt story boards to teach Bible lessons. We own our own felt board, and I've found it useful in teaching all sorts of things, from letters to the days of the week. My daughter likes to experiment with different felt shapes and figures. Flannel board felts provide a handy, fun way to teach children. The visual and interactive aspects keep kids entertained and engaged while learning. I set up The Ten Virgins story felt set and used the figures to tell my daughter the story about the virgins, their oil lamps and the bridegroom. She asked questions and liked helping place and remove the figures on the board. We talked about the time when Jesus will return to earth and how we can prepare. She also repeated the story to me in her own words, using the figures as a guide. The Parables of Jesus set is reasonably priced at $14.99 for the uncut version, $17.99 for the precut version. 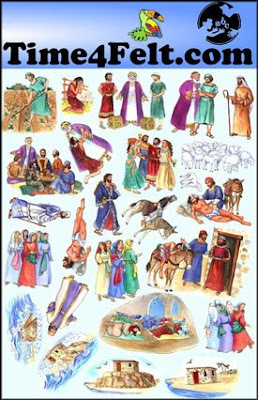 The figures are made of heavy felt and the printed images are clear and detailed. Time4Felt.com offers all sorts of products besides Bible stories including Quiet Books, story books, felt dolls, and Spanish teaching materials. I know my daughter would also love Grandpa's Farm set, one of the many general Felt Board Story sets available. Awnya's monthly newsletter includes the latest specials as well as some neat ideas, like her Teacher Appreciation suggestions for the month of May. Thanks to Faith Approved and Time4Felt.com for this review opportunity! That looks like a wonderful way to teach your kids about the bible. I never thought about getting a felt board. I'll have to look into that. My kids are always learning new things. That should be a great gift.